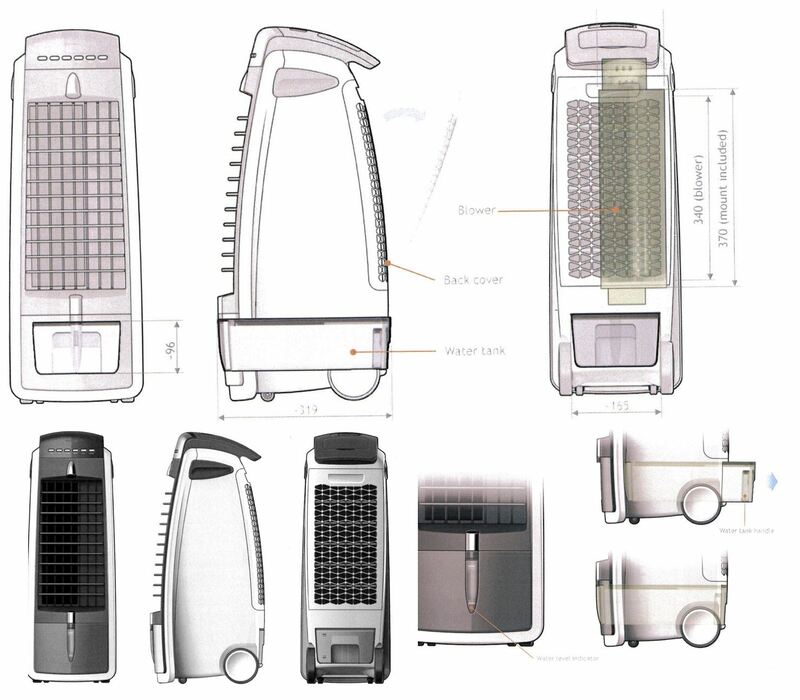 [GREEN PRODUCT] Eco-Friendly Quilo™ Air Cooler fights heat waves! Can we beat the heat waves this summer with an energy efficient cooling solution? 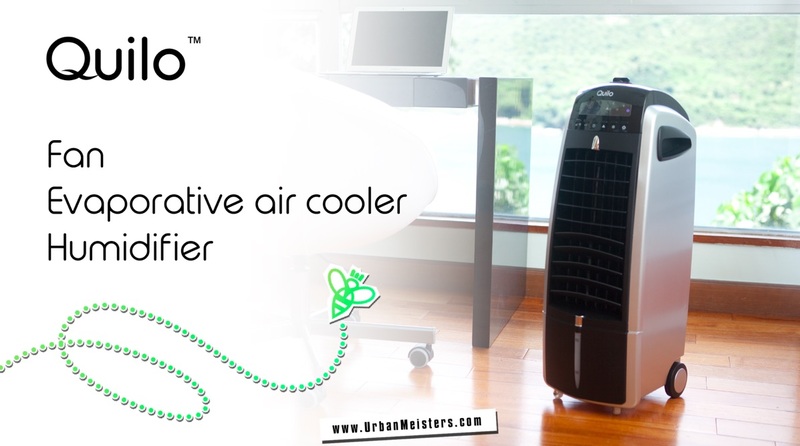 Our green product hunt gives you the innovative Quilo™ air cooler that consumes very less energy but is very effective. At UrbanMeisters we’re constantly on a green product hunt to make everyday life sustainable without compromising on quality. We feature products that fit urban lifestyle and needs seamlessly but are carbon positive, eco-friendly and practical. We’ve been one of the first to spot cutting edge and fantastic sustainable products like Repack Packaging innovation which has gone on to become a huge success having been taken under the prestigious Kering Incubator Program. Another excellent green product hunt that came on UrbanMeisters before making international headlines was Guppy Friend laundry wash bag. We were also one of the first to spot the award winning eco-friendly plant pot Airy that doubles up as a natural indoor air purifier. And today’s green product is another such innovation that has already kicked up a storm on Kickstarter! Heat waves have been the hottest topic around the world this year with record breaking temperatures everywhere. Global warming is one big reason for this increase in temperatures. And what was an infrequent , ‘happens sometimes’ phenomenon, is slowly becoming the norm. Findings suggest that this trend towards severe heat waves will continue if green house gas emissions is not controlled immediately. So essentially what we felt was an exceptionally hot June this year may actually become the normal, regular, average June in another 50-70 years time! And urban centres are worse off because here’s where heat waves become even more amplified. This is due to the urban heat island effect caused by the replacement of tree cover, vegetation and water bodies by brick, stone, concrete, asphalt, and other such materials that actually trap heat. The effect is further intensified by heat and emissions by abundant air conditioners, electrical equipments, vehicles etc in cities. What if we gave you an air cooling device that doesn’t generate heat or emit gases? Our green product hunt today brings an eco-friendly solution to beat the summer heat- the 3-IN-ONE Quilo™ – the world’s first ever fan that turns into an evaporative air cooler- all this at less than half the energy consumption of an air conditioner plus zero emissions! Quilo™ is a fantastic new innovation giving you crisp cool air at super low energy consumption. Completely portable, this mean but mini machine is not just a fan merely re-circulating the hot air- it changes with your needs. You can add water to the tank to make it a cooling device- ice works even better! And in winters its fabulous as a much needed humidifier. 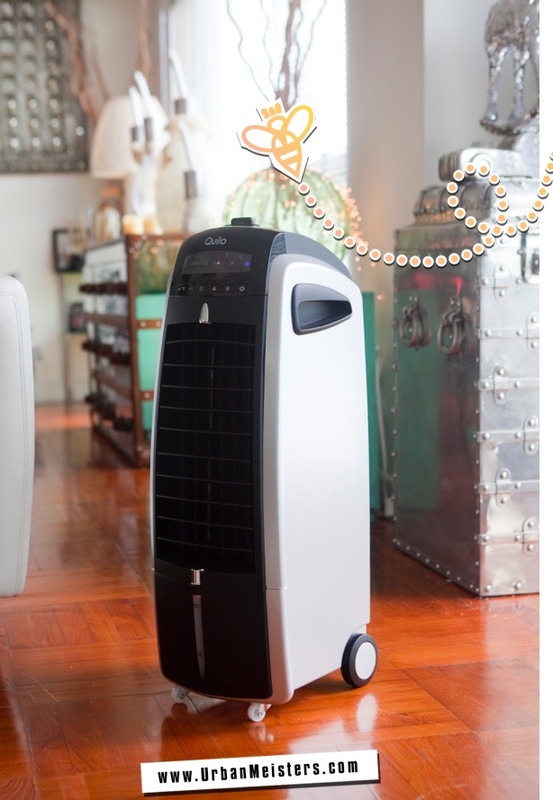 Built with the patent-pending DC brushless motor technology that minimizes energy consumption while maximising airflow, Quilo™ is a round the year eco-friendly product but the real magic is how it helps during these awful heat waves. Evaporative air coolers, also known as swamp coolers, are usually bulky, noisy, stinky (smell of old) and mostly ineffective especially during the intense heat waves. But Quilo™ can actually bring local room temperature down by up to 5 to 10 degrees Celsius / 10 to 15 degrees Fahrenheit. A low-energy LED light creates a comfortable glow during the night, while also making the water level in the tank visible for easy maintenance. And it has a remote control too! Quilo™ was created by a team of highly experienced engineers, designers and researchers, with a passion for environmentally friendly and energy efficient products. The team believes in designing and manufacturing holistic and sustainable products for home which balance high performance with energy efficiency. 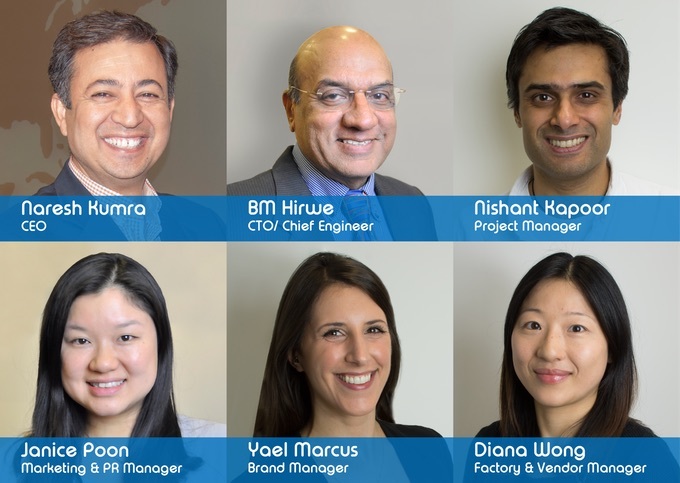 Quilo™ is led by CEO Naresh Kumra has a passion for building high performance technology companies. He is also engaged in promoting entrepreneurship and quality education. The Chief Technology Officer BM Hirwe’s primary focus is building climate friendly products especially air coolers and electronics. The challenge for the team was to create a cooling device that was as energy-efficient, eco-friendly and quiet without compromising on effectiveness. 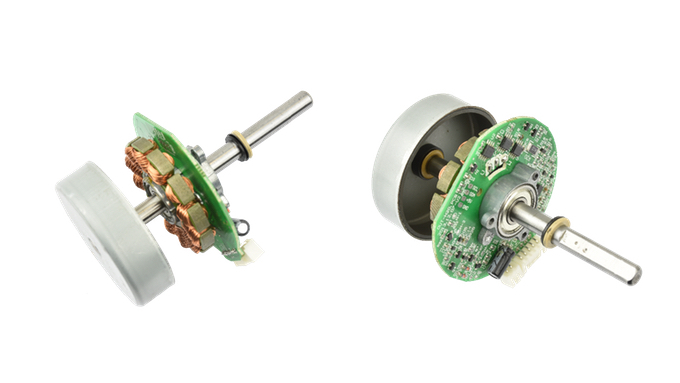 Inspired by portable battery powered devices such as laptops, Quilo™ engineers developed their ground-breaking, patent-pending brushless DC motor technology that minimizes energy consumption while maximizing airflow. The highly controllable airflow and moisture mechanism makes Quilo™ perfect for powerful cooling in the summer while conveniently converting to a humidifier in the winter. Why choose Quilo™ over commercial air cooler? Super Energy Efficient: You won’t believe how less energy this wonder green product consumes! Well, same amount of electricity it takes to power one light bulb or charging your i-pad! That’s almost a fraction of the electricity consumed by an air conditioner. 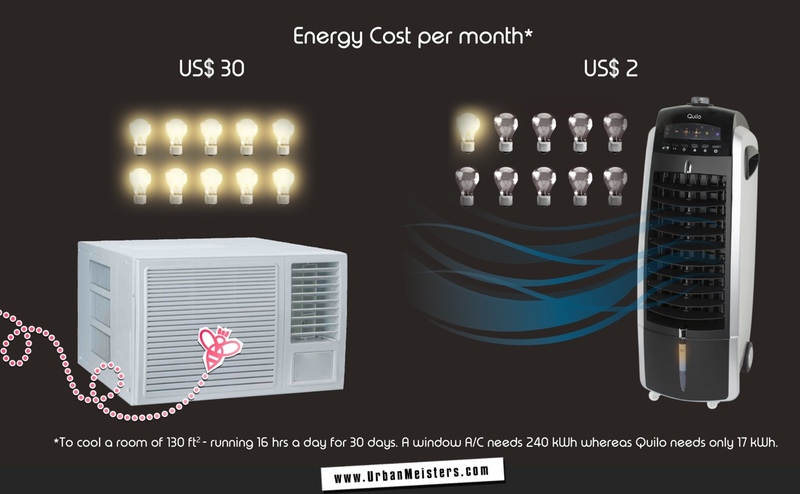 A window AC needs 240kwh to cool a room of 130 square feet running 15 hours a day for 30 days. Quilo™ on the other hand does the job in 17kwh! Zero Emissions: It has a low carbon footprint in terms of emission too- actually zero emissions! Quilo™ does not have a compressor or refrigerant gas, and does not release any harmful chemicals into the atmosphere. 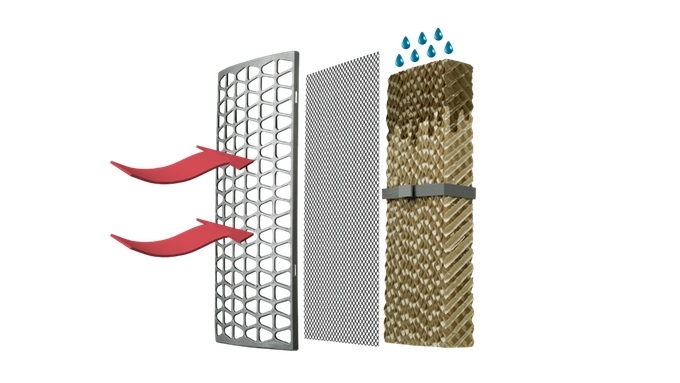 Prevents indoor air pollution: It has an Active Carbon Filter which helps filter out dust particles and odour-causing pollutants from the air, helping to improve air quality in your room. So it’s not only eco-friendly but also protects you from indoor air pollution! Another innovative product that purifies indoor air efficiently & without using energy at all is Airy plant pot. No sound: It’s the smart & silent type ;) Commercial coolers even ACs whirr and make a lot of noise. Quilo™ is quiet and provides a soothing ambient sound while cooling. 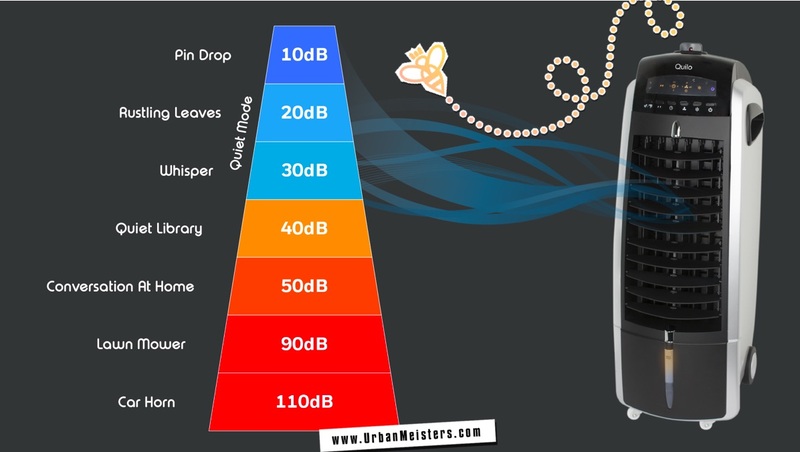 Also has a Quiet Mode, in which it operates at a whisper-quiet sound level! Perfect night companion. Portable & practical: Drag it around. Pack it easily- Quilo™ was made to move. Super light body, durable wheels and a detachable power cord which has universal voltage compatibility, Quilo™ can not only be dragged from room to room but it can also travel with you! The air cooler’s compact size, sleek body, low noise levels and pioneering technology makes it a good mix of style + function. Definitely makes it stand out in the saturated air coolers market. And most importantly it is really effective- a pretty powerful cooling device while consuming minimal electricity. Quilo™ has been featured, favourable review and endorsed by various agencies and portals. This innovative product is actively trending on crowdfunding portal Kickstarter and has in fact reached it’s full funding! But it’s still live and kicking and open for early bird pre-ordering discount! Quilo™ is available for an EARLY BIRD DISCOUNT PRICE $119 (retail price $149) on pre-orders on Kickstarter till July 12, 2017. So pre-order now below and SAVE BIG! Quilo™ team’s goal now is make this sustainable air cooling device reach as many homes and offices around the world as possible. It’s very important to be energy efficient in everyday life and products like Quilo™ help us do that without compromising on ease or comfort. So UrbanMeisters we urge you to share this product as much as possible! Let’s move away form energy intensive cooling devices that pollute and leave a negative carbon footprint. Quilo™ is exactly the kind of innovation that will help build a more sustainable future for our planet. So pre-order one and share share share! Have a question for the team? Reach out to them at support@QuiloHome.com or on their Instagram handle. For any queries on the product you can reach out to us as well at contact@urbanmeisters.com or on our Facebook, Instagram, LinkedIn orTwitter handles. We completely love this energy efficient, eco-friendly air cooler that helps beat the heat waves without polluting the planet. You may also like to read more tips on how to be more energy efficient at home in general here. #GreeningIsWinning UrbanMeisters so jump into the movement!